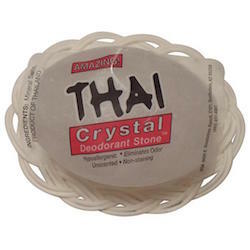 Deodorant Stones of America Thai Crystal Oval Stone in Basket 3.5 oz. Deodorant stone milled to perfection and displayed in a handmade rattan basket. Beautiful to look at on a counter top or shelf. Lasts over 1 year.